PI185. A tan drill housewife stamped V450 Made in Australia 1944 and A arrow F.
PI185. Stamped V450 Made in Australia 1944 and A arrow F.
PI196. A khaki drill housewife containing darning wool, reels of cotton and needles, written inside is FORD A219917. PI197. 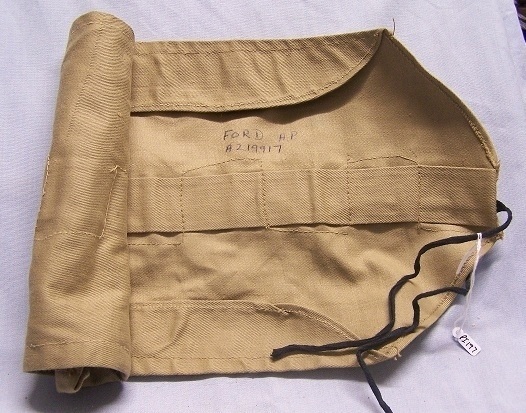 A khaki drill personal effects roll named to FORD A. P. A219917. PI223. Number and name written on housewife. PI231. 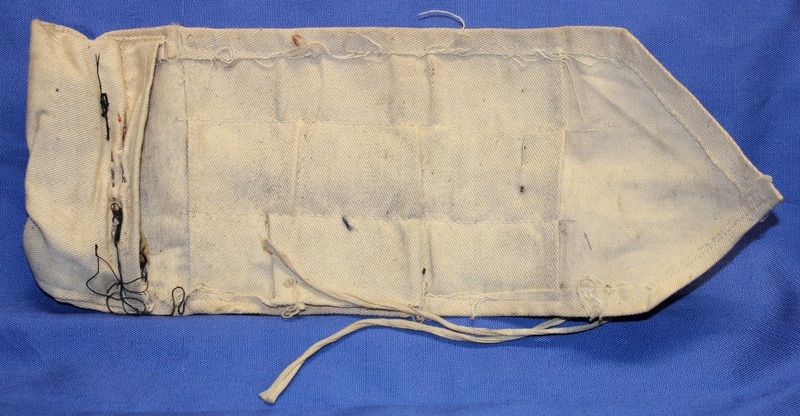 A khaki drill housewife containing darning wool, cotton, needles and zipper, written inside is 439816 MEADLEY. Kenneth Robert Meadley enlisted on 31 Jul 1943 at Sydney and discharged on 13 Feb 1946 as a Warrant Officer from 9 Aircrew Holding Unit. PI261. 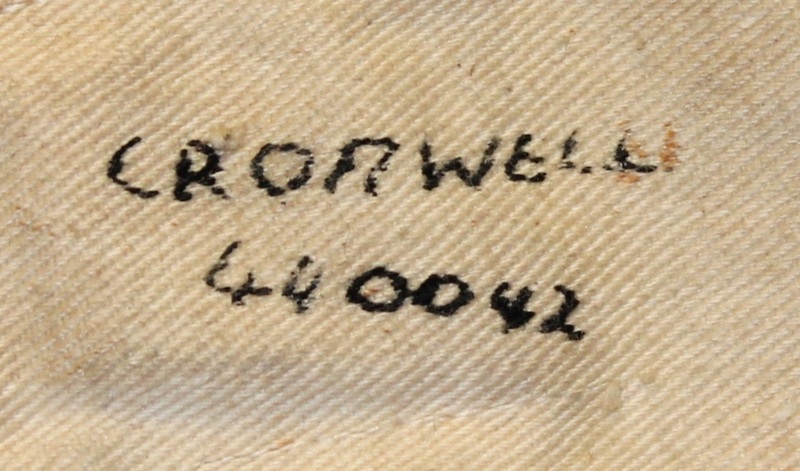 A khaki drill housewife containing darning wool, cotton and needles, written on the outside is CROAWELL 440042. William Robert Alexander Croawell enlisted on 6 Sep 1943 at Sydney and discharged on 2 Aug 1946 as a temporary Warrant Officer from 113 ASRF Command. PI261. Name and number written on housewife. PI270. A tan drill housewife stamped V450 Made in Australia 1944 and A arrow F.
PI276. 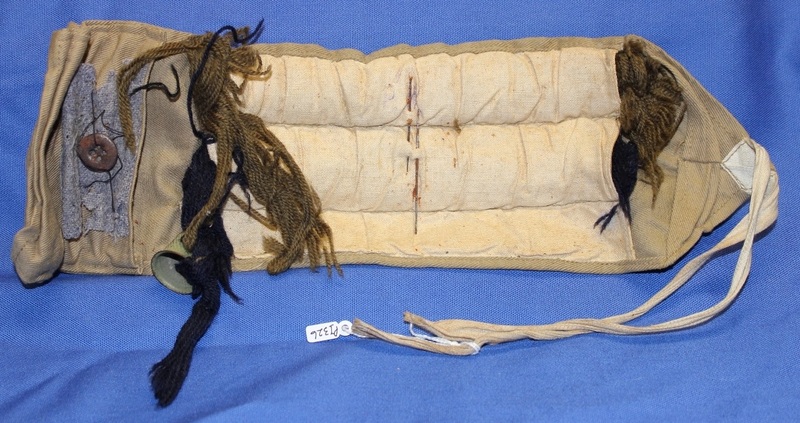 A khaki drill housewife containing darning wool, buttons, cotton and needles, stencilled inside is 19972. R.A.A.F. CARFRAE. A. K. Archibald Keith Carfrae enlisted on 13 Dec 1940 at Melbourne and discharged on 6 May 1946 as a Corporal from Station HQ Point Cook. PI296. 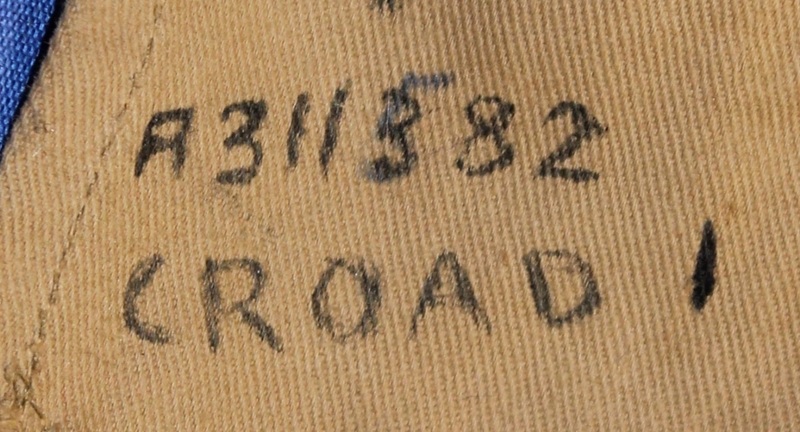 A khaki drill housewife marked inside ASH E R 433883, written on the outside is 433883 ASH. Edward Robert Ash enlisted on 5 Jun 1943 at Sydney and discharged on 9 Apr 1946 as a Warrant Officer from 14 Aircrew Holding Unit. PI326. 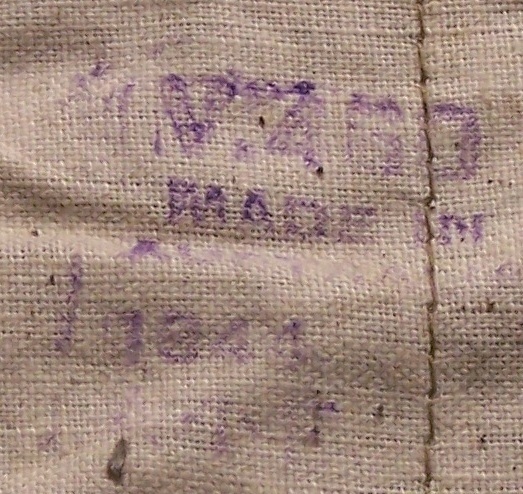 A khaki drill housewife containing darning wool and a thimble, written on the outside is R.A.A.F. 44769. Henry Roy Hill enlisted on 16 Mar 1942 at Brisbane and discharged on 10 Jan 1946 as a Corporal from 6 Aircraft Depot. PI326. R.A.A.F and service number written inside. PI327. A khaki drill housewife made by Melbourne Textile Factory MTX containing darning wool, stencilled inside is A31128 A. S. CLARKE RAAF. PI372. 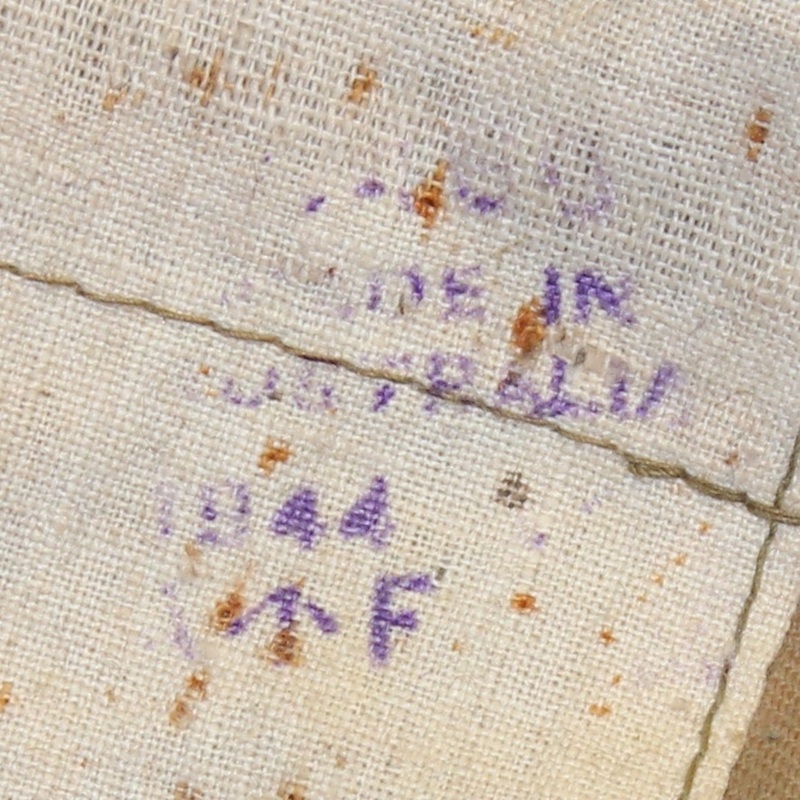 A khaki drill housewife made by Melbourne Textile Factory MTX containing darning wool, reels of cotton and needles, stencilled on the front is RAAF 5462. Eric Headly Wilson enlisted on 5 Dec 1939 at Laverton and discharged on 16 Jan 1947 as a Sergeant from 4 Personnel Depot. PI372. R.A.A.F. and service number stencilled on outside.